Meraj Sheykh is an Iranian professional kabaddi player born on 26th May, 1988. An all rounder, he currently plays for Delhi Dabang K.C in the Pro Kabaddi League and is nicknamed as the ‘Cheetah’ or at times ‘Magical Meraj’. Meraj started playing the game at a young age of 12. Kabaddi is widely popular in his hometown and believes that the introduction to the game at a young age is something that holds common between him and the Indian players. Meraj was a professional wrestler for 10 years before switching to kabaddi and thus, his experience in the ring helps him possess great reflexes and agility on the mat. In the 2016 Kabaddi World Cup final, Meraj was the captain of the Iranian side that lost to India. It was a close knit game, which unfortunately didn’t end well for Iran. Meraj was his team's best player and a constant threat to India defending their title. In the 2015 PKL, he was given the captaincy of the Telugu Titans, making him the first foreign player to captain a team in the league, and from then he rapidly rose in the league. He currently plays for Dabang Delhi and has captained the team twice in Season 4 and 5. In the Season 5 of PKL, he finished as the best foreign player for his team with 104 points to his name. Meraj's captaincy and leadership has been impressive throughout the league. At the beginning of the 5th season, Meraj became one of the seven players to be retained by their sides, when Dabang Delhi chose to retain him clearly showing how crucial he is to the side. 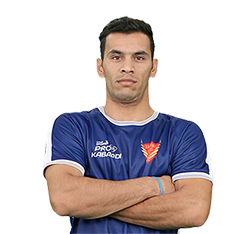 Meraj put in a powerful performance in Season 4 for his team and was the best foreign all-rounder with 75 points to his name and remains one big anomaly in the Pro Kabaddi League being the non-Indian captain in a sport dominated by Indians.